Which are the top hotels you would think of when visiting India? Indian hospitality can’t be completely described without mentioning Taj, Oberoi, ITC etc. None of the international hotel chains has been able to challenge the Taj Group of Hotels (The Indian Hotel Company Limited) over the past decades. However, after Marriott International attained Starwood Hotels & Resorts in 2016, it became the largest hotel operator in India with at least 18,000 rooms or 11 per cent of the domestic market. This means the Taj Group, which has been in first with its more than 14,000 rooms, slipped to second place in the list of largest hotel chains in India. Now that comes as a shock to The Indian Hotel Company limited which has a lot of catching up to do now. Before the merger, the U.S.-based Marriott hotel brand was the fourth largest with Starwood being the fifth. Marriott Further aims for rapid expansion by constructing new hotels as well as acquiring multiple management contracts. The Oberoi group and ITC Hotels have been the key competitors of Taj Hotels over the years. Marriott’s quick journey to become the top hotel operator in India can thus be an indication of the changing landscape of the Indian Hotel industry. Taj Group is an iconic Indian brand of hotels that has dominated the domestic market ever since its inception over a hundred years ago. With its own expansion plans, the Taj group is set to give a fight back. The biggest gainer through this clash of Titans is going to be the Indian hotel industry. Marriott which is one of the largest hotel chains in the world, now has almost 30 unique brands in India such as the Ritz-Carlton of Starwood and the W of Marriott, which is being developed in Goa. Marriott operates 118 properties in more than 20 cities in India. The group has plans to open an additional 80 properties in more than 30 cities during the next few years. Marriott Hotels have been right at the top as one of the best hotel brands across the globe. This hotel group has made rapid strides in the Indian hotel industry as well. The hotel chain has properties to suit all hotel segments. Have a look at the 118 properties of Marriott in India which is set to increase in the coming months. The company has 30 brands around the world with more than 5,700 properties in more than 110 countries – brands that include: St. Regis, Bulgari Hotels & Resorts, Sheraton, Fairfield Inn, Westin, etc. The two companies will now operate as one to operate the properties and 1.1 million rooms. After Marriott acquired Starwood, its services doubled in the Middle East and Asia. The merger has had all the regulatory endorsements in place, so it’s all legit. According to a source, Starwood brands will stay as they are. The only change happening is to the legal management body. Under the flagship of reputed TATA brand, Taj Hotels have been synonymous to hospitality in India. The hotel group has stayed as the most loved brand in India. Indian Hotels Company Limited (IHCL) is the organization that owns the Taj Group of Hotels and Resorts or simply the “Taj Group” as it’s popularly called. 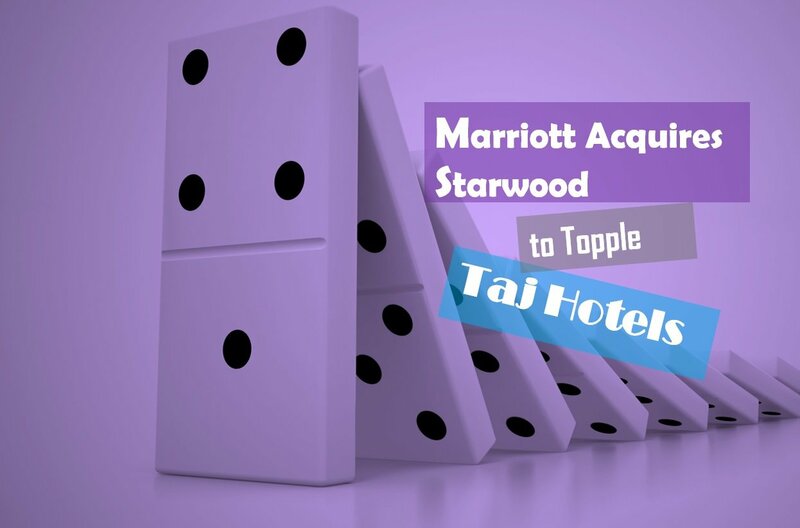 The Hotel group before the Marriott acquisition of Starwood held the coveted number one position in terms of the largest hotel operator in India for years. Taj Hotel operates over 100 hotels in India and has expanded to the USA, UK, Maldives and other parts of the world. There are a lot of hotel chains like Vivanta, Taj Exotica, Taj Safari among others in the Taj group flagship. A lot of hotels of Taj like Udaipur Lake Palace and Taj Falaknuma Palace in Hyderabad have been in several global listing of top hotels. Tajness as a concept of superior service has been introduced recently by Taj Group to ensure consistency in the level of service across all Taj Hotels. As the group is now toppled from the numero uno of Hotel operators in India, the Taj Hotel group is expected to fight back. Taj hotel still is the biggest Hotel brand in India but in terms of hotel rooms, they do have some catching up to do of sure. Indian Hotel industry is one of the most lucrative markets in the world. Almost all the top hotel chains are aiming to dominate this market. Marriott has ensured a big momentum shift by leapfrogging Taj Hotels as the top hotel chain in India. The aim of expansion by Marriott Hotels further challenges all top hotel providers. The competition from Startups like OYO; which was rated as one of the top Hotel Management companies in 2018 in India; and from Apartment Sharing websites like Airbnb will make the competition even more interesting. The shift in momentum will only benefit the Indian hotel industry and travellers. Exciting times ahead for the Indian hotel industry for sure.